This is a detailed guide about all the endings in the game. There are diagrams for each day as well as for each character. 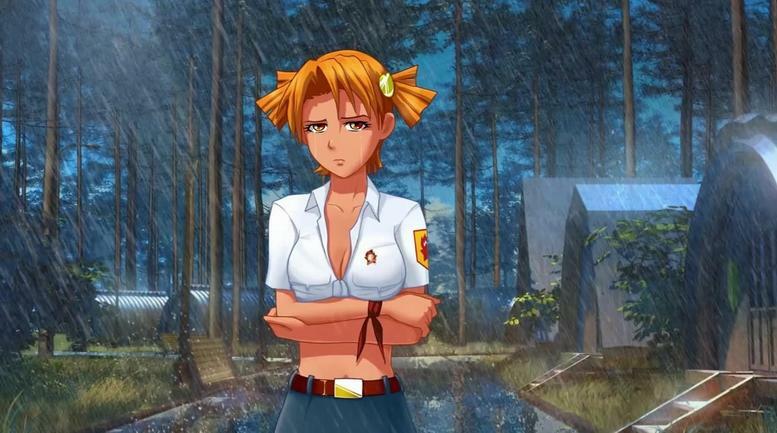 The game contains 5 main character stories (routes) and 3 special stories, with 14 different endings. Some choices you make will assign a score (either positive or negative) to one of the routes. If you collect at least 6 points for a certain route at day 5, then you can play that route. Each route has a good and a bad ending. You get the good ending if the final score is at least 9, a bad ending if the final score is between 6 and 8. 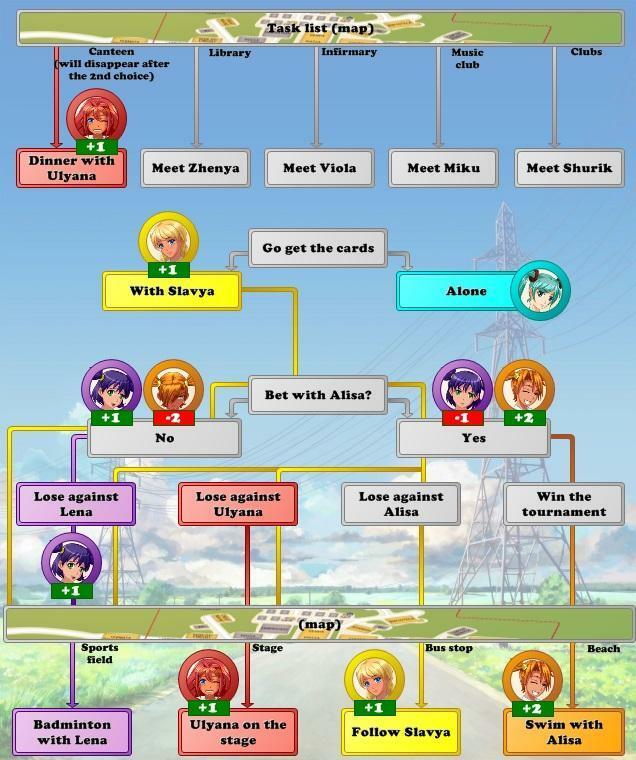 Miku's and Yulya's route don't have a score, you just have to select all the correct choices in order to unlock them, but only after having completed other endings (see the details in the diagrams below). 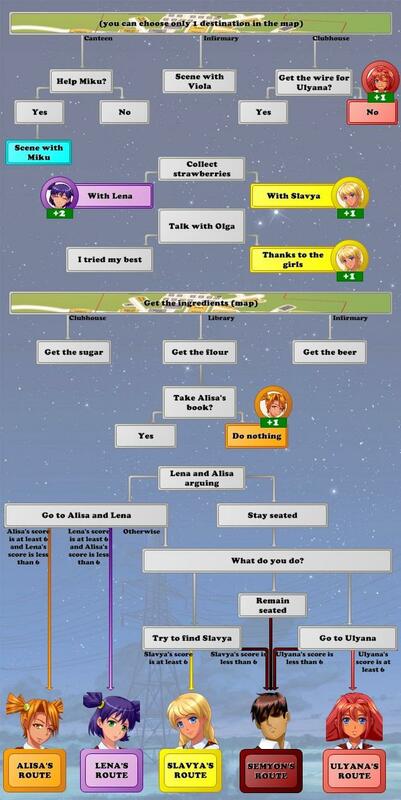 Here are all the detailed diagrams for the choices in the game, grouped by day. 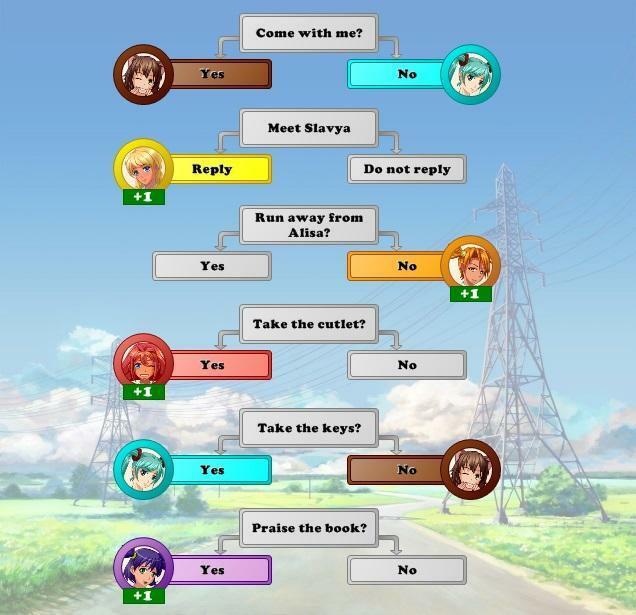 The nodes with a character icon indicate that the choice affects the associated character's route. There can be a number indicating the score assigned for that route (green if positive, red if negative). The colored nodes indicate which girl the scene is about. The colored arrows indicate which choices you have to make in order to achieve a certain outcome. 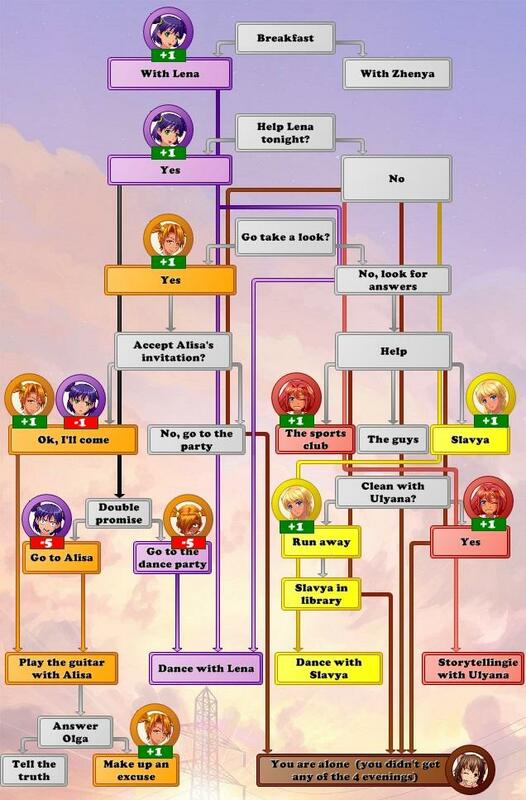 Below there are lists of all the choices that affect a certain route. The first circled number on the left indicates the score of the associated choice (green if positive, red if negative), and next to it the gray number indicates the maximum score obtainable for the route at that point of the story. 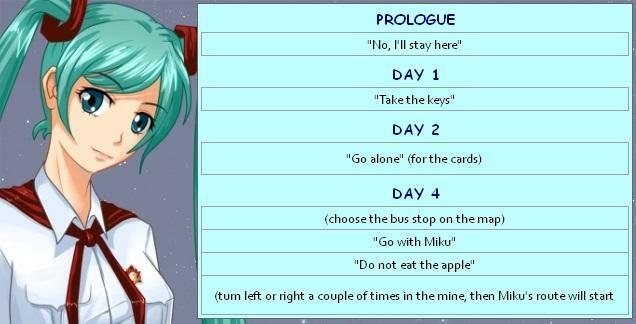 This is one of the special routes, you have to have completed at least one positive end (Semyon, Slavya, Ulyana, Alisa or Lena) in order to unlock Miku's route. After that, play the game again selecting all the choices listed here, and Miku's route will start. This is one of the special routes, you need to have completed all the positive ends (Semyon, Slavya, Ulyana, Alisa and Lena), and also Miku's end, in order to unlock Yulya's route. 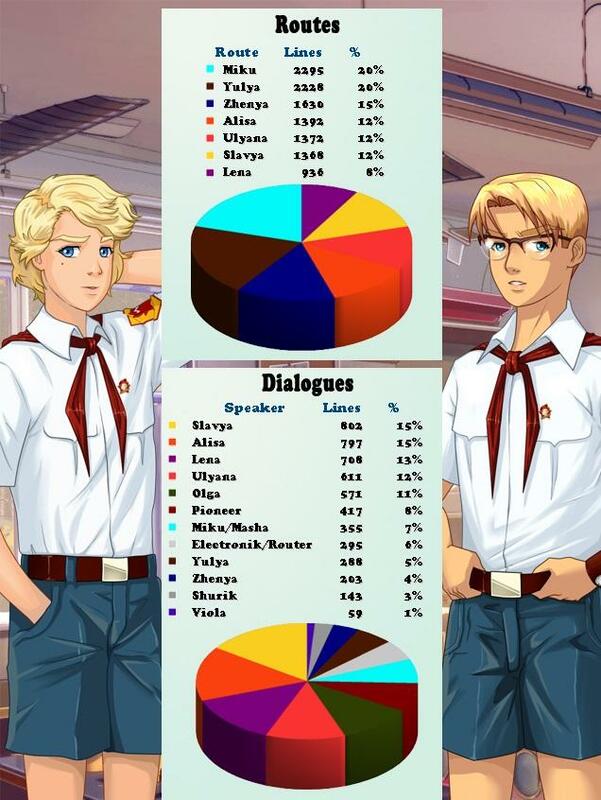 After that, play the game again selecting all the choices listed here, and Yulya's route will start.